Travis Book, local singlespeeder hardman of the Infamous Stringdusters will be playing for us; at Devils Backbone Brewery down in Nelson County. The Devils Backbone Trails will be open all day, we’ll have DBB beer; and food of course. Stay tuned for some earlier guided ride options way up high in the National Forest, the morning of. All beer sale proceeds go directly to CAMBC, to support our efforts on our local trails; like tool purchases and equipment rental for Ragged Mountain (see above ^). This is going to be a great event. Kids of all ages, fabulous LOCAL music, food, beer, and trails. Oh yeah, it’s in the heart of springtime too! More details as we get them, but plan on attending with the whole family. Beginner Ride: 12 noon. Meet at Devils Backbone Brewery parking lot, here: DBB location. Sean Denham and Matt Mcclleland are the ride leaders. This will be a 1 ish hour ride on the flat trails on the Devils Backbone campus. After the show, Travis Book will also be leading a ride, 6 pm. Travis lives on site and built most of these trails! Intermediate Ride: 9 am. Meet at the entrance to Sherando Lake, here: Sherando Lake Entrance location. Ride leaders are David Stackhouse and Derek Glass. This ride will include significant but low grade climbing, lots of excellent single track, and some fun challenging rock gardens. The route: up White Rock Trail to the Blue Ridge Parkway up to Slacks Overlook, Back down Slacks to Sherando Lake. 2-3 hrs. 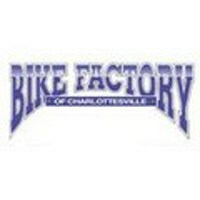 If you have fun on the Rivanna trail, Ohill, and/or Walnut Creek, this ride is for you! Self supported: bring tubes, food, water, repair equipment, etc. Advanced Ride: 9 am. Meet at the Turkey Pen trailhead on the Coal Road, Sherando, here; Coal Road meeting location Ride leaders are Todd Neimier and Kyle Rodland. This ride will be a classic Sherando suffer fest. Expect loads of climbing and some very challenging downhill. ROCKS. Possibilities include Torry’s Ridge, Kennedy’s Ridge, etc. 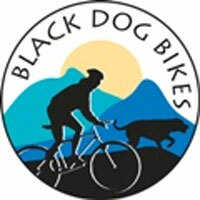 If you have been craving a big mountain ride but don’t know the good routes, this ride is for you. Please bring plenty of food and water, at least two tubes, spare hanger, patch kit, etc. Music! 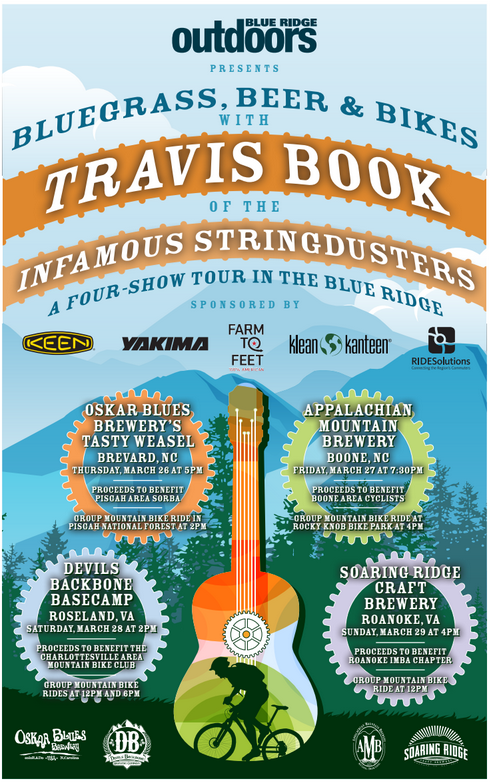 : Travis Book of the Infamous Stringdusters will begin at about 2pm, and play until 5ish at Devils Backbone Brewery. Kleen Canteen Stainless pint cups are $20 which includes beer. Admission is free otherwise. Food and such will be available via the DBB restaurant. Raffle tickets, swag, and other fun stuff is to be had! Join us!! Camping: Set up will be available anytime on Saturday. Camping will be in a nice grassy flat area, next to your vehicle, right on the campus. Car camping works. PLEASE rsvp here: Free camping and breakfast RSVP If we don’t know you are coming, we won’t have the proper porta-johns and the right amount of food. Do me a solid favor and hit the link, add your name. Deadline for camping/breakfast RSVP is Thursday night. Camping/after party will likely include: campfires, night laps on the trails, and good times for everyone. Breakfast will be provided by CAMBC on Sunday morning. If you don’t like pancakes, eggs, bacon, juice, coffee, etc. you’re out of luck! 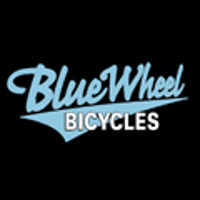 Breakfast starting who knows when…, but probably 7, 8 am or so..
Beginner Ride: 10ish, possibly earlier, meet at DBB: Ride Leaders are Joe Hoskins and Sean Denham. This will be a variation on the same rides as Saturday. Intermediate Ride: departing DBB at 10ish: Ride Leaders are David Stackhouse, Geoff Keenan, Matt Mcclelland, Bobby Casteen, and John Maine. This ride will be a bigger ride than Saturday’s intermediate ride, but similar in terms of difficulty, at Sherando. We will sample some of the classic routes! Advance Ride: Ride leaders are John Lewis and Chris Hoy, departs DBB at 10ish for Whetstone Ridge. 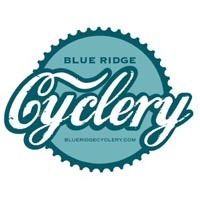 This ride is one of the more difficult but spectacular rides in the Blue Ridge. Plan on some hike a bikes, rocky chutes, a long flowing downhill, capped with a pavement/gravel climb back to the Blue Ridge Parkway. Plan for mechanicals!! This is a 4-5 hr adventure. Don’t forget to RSVP (Free camping and breakfast RSVP) for the camping by Thursday.